Any cable with a DB25 D-sub connector on one end and eight balanced jacks on the other should be fine for analogue interfacing. I recently acquired a Focusrite Control 2802 analogue mixer/DAW controller. There are numerous connections on the back, including three female DB25 interfaces. These are labelled ‘DAW Inputs (1-8)’, ‘Direct Outputs (1-8)’ and ‘Summing Inputs (1-8)’. The manual says: “These interfaces are wired to the Tascam DA-88 25-pin D-sub standard”. To these, I am trying to connect to a Focusrite Scarlett 18i20 (first edition) USB audio interface which uses TRS jacks for both inputs and outputs. The next step is to obtain two DB25 (male) to eight TRS jack looms. This is proving more difficult than it looks, as ads for some of the cheaper brands specifically say “not suitable for TDIF”. And TDIF is Tascam, right? I seem to remember the Tascam DA-88 as being a distinctly digital recording device, so I don’t understand why Focusrite are using a digitally-inspired wiring convention to execute what seems to be conventional analogue in/out? There are more expensive ‘pro’ looms available, but they are about £25$35 more each, and they don’t say anything about Tascam one way or the other. Can I assume they will ‘just work’? Technical Editor Hugh Robjohns replies: I see the source of your confusion, but the answer really is simpler than you think — and the short answer is that if it has a DB25 D-sub connector on one end and eight TRS jacks on the other, then yes, it should work. I say that because while DB25 connectors are used for both analogue and digital audio interfacing, the digital ones won’t be terminated in TRS jacks! TDIF was a Tascam digital interface — in fact, it stands for ‘Tascam Digital InterFace’! — but it used a proprietary digital format and is now largely obsolete. Tascam also conceived an analogue interface using 25-way D-subs carrying eight balanced analogue channels, first used on the DA-88 (because even digital recording devices usually require analogue inputs and outputs!). This interface has become ubiquitous — it is used in the Focusrite Control 2802 and various other pro-audio devices with multiple channels (multitrack recorders, consoles, audio interfaces, 500-series chassis and so on). In fact, it’s such a common format that the AES have adopted it as an industry standard (AES59); it is now the only wiring format for eight channels of balanced analogue on a 25-pin D-sub. 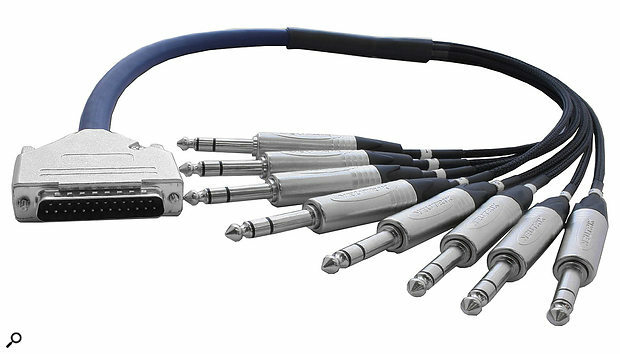 For digital (AES3) connections on 25-pin D-sub connectors, there are two current formats: the Tascam/AES59 format and the Yamaha YGDAI format. But the digital connections will have either another D-Sub on the other end, or four male and four female XLRs. Hence my suggestion at the outset that any 25-pin D-sub to TRS loom will be suitable — because it will be wired according to the Tascam/AES59 format.